Psychotherapist DERMOD MOORE’s unsparing dissection of the modern gay man makes for tough but ultimately rewarding reading. If you’re in the UK or Europe, you can buy it from Amazon.co.uk. If you’re in the USA or Canada, or anywhere else for that matter, you can buy it from Amazon.com. 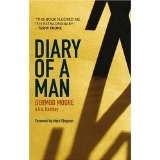 You can browse Diary of a Man online at Google Book Search. Take a look and see!